It would be great if we sometimes could conduct MilSim operations together. Knowledgeable in a great many useless things. Hey ppl. Unfortunately our image hosting site Green Faces has been terminated. That means that all our pictures is no longer available to view. I am however looking for an alternative so that we can keep showing pictures to each other! Stay tuned for I will update the old link with new pictures! Right.. The old broken links of the pictures have been fixed. I am also adding a few new ones! This is one a very few photos showing that we don't hibernate like many teams up here do during winter. Lex is showing our favourite playground and our favourite weather. Why?.. In wet conditions the opponents tend to be less careful with positions since ppl most often don't want to get wet like we do. Actually we kind of like it that way. If you get wet enough it stops bothering you. Our OP during one of our Recce Ops. Exhaust taking a look through the binoculars from the same OP. Obstacles are made to be overcome. Here is Exhaust with one of his evil smiles. Here is the latest buy I made (G36) compared to my latest project (Armalite 933). 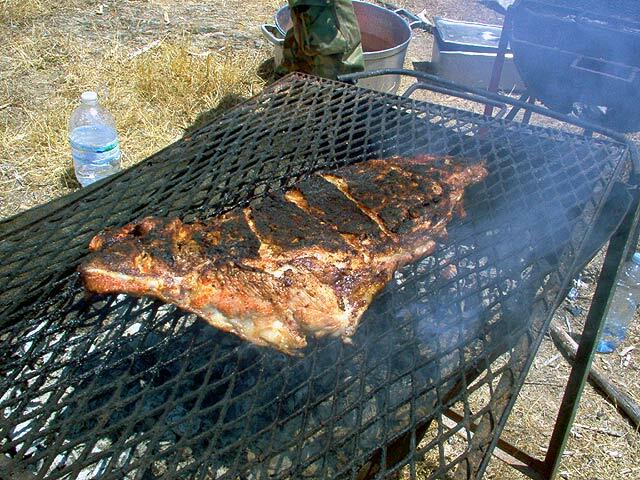 Just because you are out in th ebush it doesn't mean that you can't prepare a good looking and tasting meal. And if you're not in the bush but at home you can always do this. I hope I haven't thrown to much over to you! You have to register again in the gallery because the login system´s are not connected. Great to see that we share the same taste! Ps thanks for the link. I am on it already! Going to stuff some in there in the next few days! Hey guys.. I am sorry that I have taken so long but I have had a lot to do! As some of you know I was hoping to get my hands on a Mojji Spider scope..
Well that seriously failed so I hade to get another scope. I found one..
And after I found it I hurriedly attached it to the new rifle..
Why don't you guys take a look and see if you like it?? It has become quite heavy but I have still fallen in love with it! And here are the two rifles before I started working on them. carry handle and top rail. Too bad about the mojji spider scope, but I see you have found a great replacement. I don’t really like scopes, I prefer Red-dots or holo sights. They are awesome to acquire your target really fast. But in your case I guess that scope will help you a lot to find e eliminate any threat at a distance. The G36 is really an all round gun, I’ve to tell you… you really have good taste!! He!he!he! My friend.. Our taste is more similar than you can imagine.. 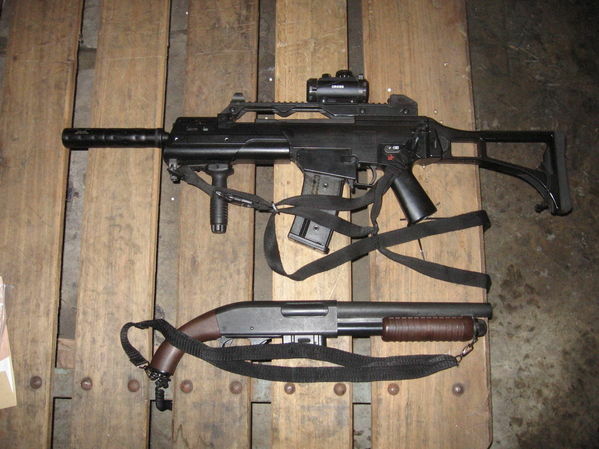 I actually have one ov those CA870 Pumps as well. I have a great photo of one of my teammates with it stapped to his pack under a MilSim.. I am just going to try and find it. Well.. In my loong G36 I have shimmed the box, changed the piston head, changed the barrel and hoisted an M120 Spring into it to make it somewhat more powerful.. But since I am more MilSIm than skirmish kind of guy I don't need to much effect or range so I stop there! I am going to start a little upgrade on my C as well shortly.. Nothin much but some cosmetic changes mostly! Man I really long for our next time out back! ) We are planning for a winter MilSim now with another MilSim outfit. I think it will be awesome if they decide to participate! nice picture with the wet suit, take care with the cold watter, last time I get wet in there it was 8ºC. Hey all.. Greetings from Holland! excellant photographs of your team. Must admit you have definatly achieved a proffesional look, well done.